The combination of hygienic, quiet, large-capacity and filled with options is no longer just a dream with the Affinity Series FRIGIDAIRE FAQG7077KR. This 7.0 cubic feet dryer comes with 12 helpful drying options plus some extra handy additions, such as the Extended Tumble and Shrink Guard Ultra. The primary Classic Red color is also energizing. 12 drying options including the Extended Tumble and Shrink Guard Ultra. Multiple options are helpful in improving cycle settings. 7 drying cycles included in this product covering the basic cycles from delicates to heavy duty loads. Also a Quick Cycle that dries clothes in 25 minutes. TimeWise technology offers speed and efficiency to each cycle. 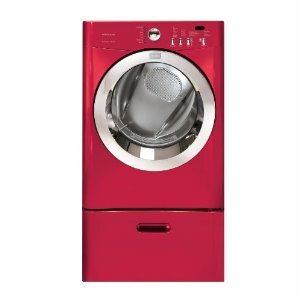 The NSF certification mean this is an efficient dryer and also as a hygienic one. 99.9% or almost all of the harmful germs and bacteria are destroyed. The primary color is classic red. Other colors include classic blue, classic black and classic white. Though the product is not that bulky and can fit into most laundry areas, the drum capacity of 7.0 cubic feet is big enough to finish the average load of garments. The drum is made of stainless steel to avoid rusting. Express Select Controls make this product easy to use. Safety features, such as the Control Lock. Children and adults alike will not be able to open the door while the product is in operation. Easy to use controls. Someone who is doing his own laundry for the first time will not have trouble understanding what to do. A sound insulation package prevents the product from creating a ruckus while drying even the heaviest loads. There is a drum light for easy interior cleaning. The number of drying cycles may not seem enough when compared to other models from the Affinity Series. The product is not Energy Star certified. Join in and write your own page! It's easy to do. How? Simply click here to return to Frigidaire clothes dryers.